A deck of illustrated symbolic cards to be used for inspiration, advice, and reflection. 127 backers pledged $4,800 to help bring this project to life. UPDATES: Be sure to click on the "Updates" tab above - I will be asking for your input and posting about my progress on the artwork. Hello! I'm Aijung Kim and I’ve been an artist all my life. I love images, storytelling, games, and an element of mystery. My latest project, The Golden Moth Illumination Deck, combines all of these things into a neat little package. The Golden Moth Illumination Deck will be comprised of 68 symbolic cards illustrated by me. 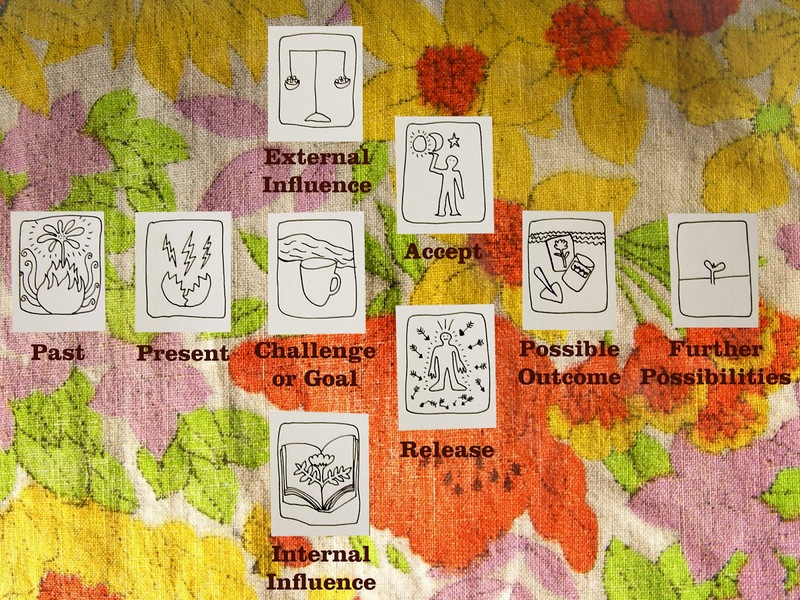 It can be used like a tarot deck to provide insight and awareness into a situation. The deck will be printed locally in Richmond, Virginia by Parcell Press, a printer, zine/comic distro, and supporter of independent publishing. Each card measures 2 1/8" x 3 1/4" (slightly smaller than standard playing card size), making them convenient to carry around with you. The cards will be printed in gold and blue inks on 100% recycled paper, and this first pressing of 250 will be signed and numbered by me. The deck will come complete with a guidebook that explains how to use the cards and an illustrated spread sheet to lay the cards into position. The cards are a tool to access your subconscious mind and become alert to your thoughts, actions, and emotional patterns. Pictures are powerful. Through images, a vague thought or blustery emotion can take on form and become clear. Seeing your life’s patterns in a non-threatening way through a game-like deck of cards can be a powerful tool for transformation. You can use the cards much like you would a tarot deck, giving readings to yourself or others. When I give a reading to another person, I have that person think of a question or a matter they want insight into. I shuffle and spread the cards facedown, and let the querent pick the cards from the deck. Then I place the cards face-up in the appropriate positions and “read” what they say about the situation or problem. I like to read the cards as if I’m telling a story to myself – trying to figure out how the images and symbols interact with one another and form a narrative. The cards provide a visual map of the patterns that shape a person’s life, becoming a story of how they perceive their world. Using the cards can help people to become more conscious and empowered about the choices they make. It is also a tool to develop your intuition and keep your mind open to seeing things from a new perspective. I made this deck in the hopes that people would be able to derive their own insight from the symbols and not be intimidated by prescribed meanings or historic background. While the guidebook will give suggested meanings for the symbols, the cards themselves are not labeled with any words to influence their significance. The symbols are simple, but over time you will discover their multiple dimensions. Their meanings will deepen in your hands because you will infuse them with your own personal history and insights. 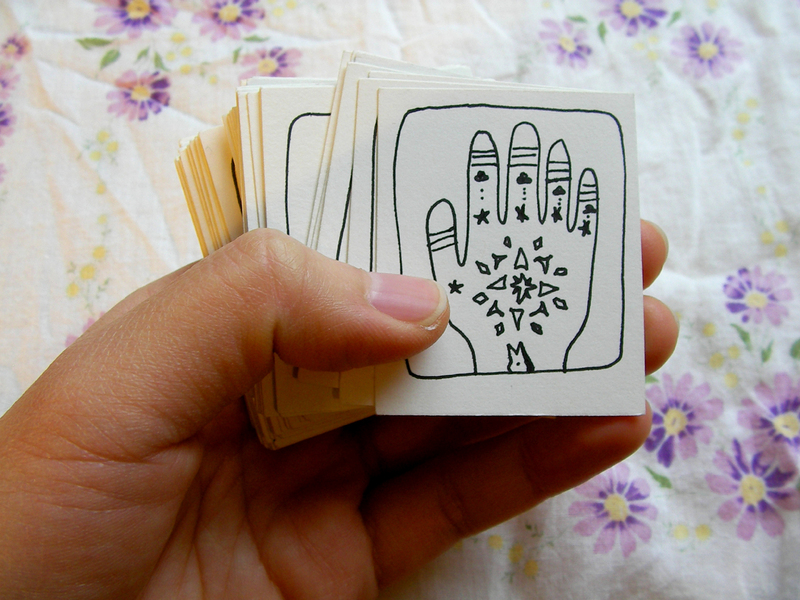 The deck will even include a handful of blank cards for you to draw your own symbols on. I encourage you to make these cards your own! And if you're not into fortune-telling, the deck can be used in any way that you can imagine. It would make a great gift for someone who collects card decks. 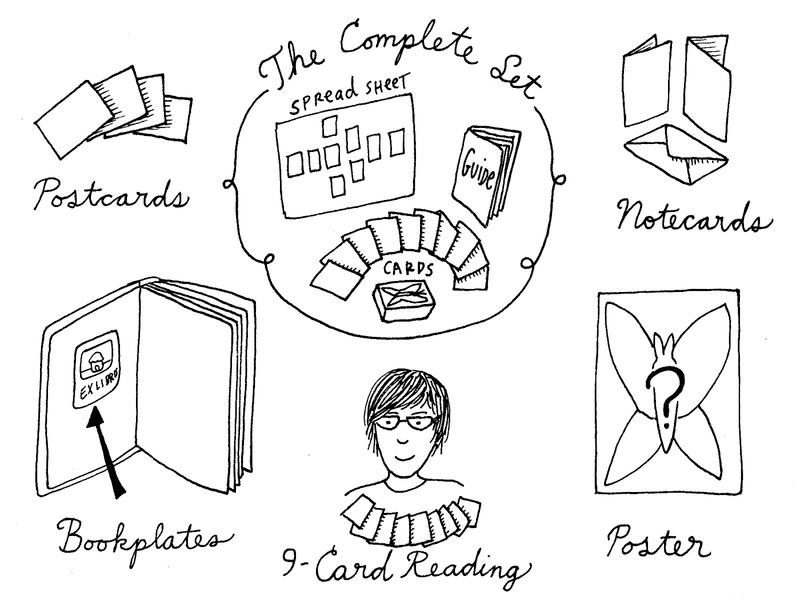 Writers and creatives can pull a card to generate story ideas and concepts. It would make a fun storytelling game for children. The cards can be used for decoration or as a small gift to tuck into a letter to a friend. Once they're in your hands, you can do whatever you want with them! Where Do the Funds Go and What are the Rewards for Pledging? I am using this campaign to fund the printing and publishing of the card deck and accessories, as well as the printing and shipping costs of the other items produced as reward incentives. I created the prototype for The Golden Moth Illumination Deck a few years ago, not long after I moved to Richmond and I had no luck finding a job. I had more free time to make art and participate in craft shows and exhibits, and so it was the perfect opportunity to try out my idea. 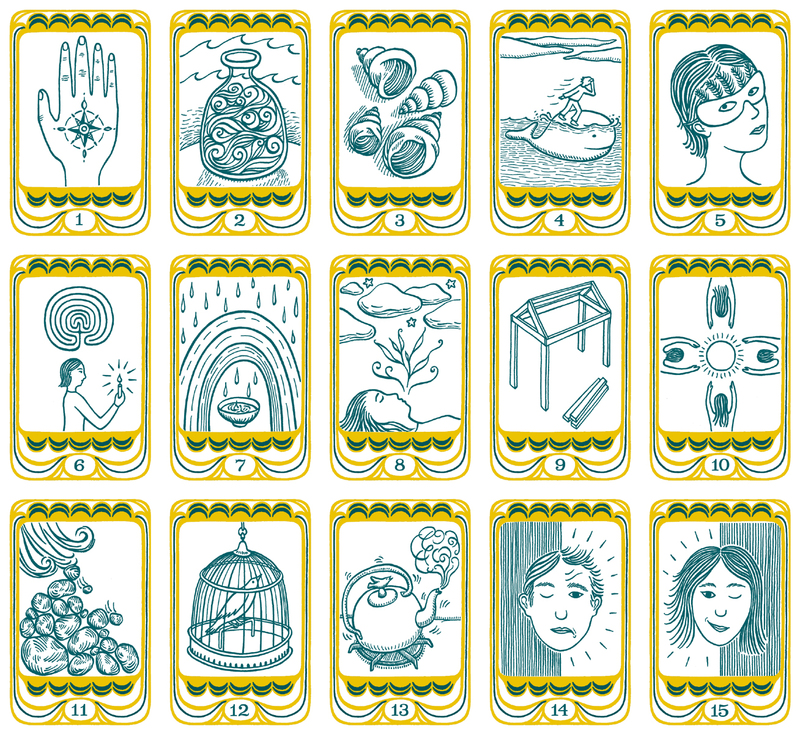 I had always wanted to make my own illustrated deck of tarot cards. I love all those pictures loaded with meaning – a blindfolded woman holding two swords across her chest; a fool with his eyes on the sky and one foot ready to step over a cliff, a woman gently holding open the mouth of a lion. The cards run the gamut of human drama, from joy to trifles to pain. The problem for me with tarot is that I never felt like I could make it my own. I always had to consult a guide to understand the meanings, and it didn’t seem to come naturally to me, partly because of my impatience! So I decided to make my own cards. I made my first deck quickly, drawing symbols in the simplest, most direct way possible. 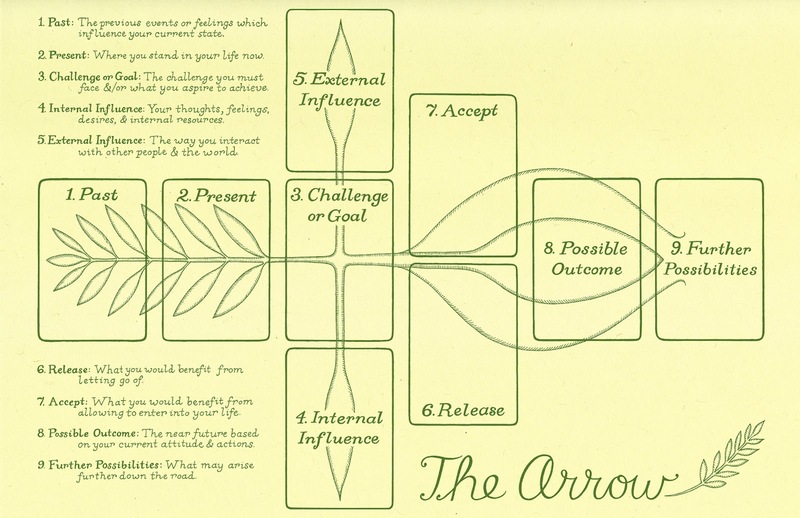 I drew inspiration from the Tarot and other divination systems such as I Ching and Runes, but I chose symbols that I thought would connect on both a personal and universal level. Then I took my cards to a craft show and put up a sign that said I offered readings. I was nervous giving my first few readings, but also excited. I found that not only did my querents have to trust me, but I had to trust myself and what the cards told me. I had to be mindful that people came to me with sensitive issues that they sometimes didn’t want to discuss. But often after a reading, the querent would become more talkative and excited. I would see a lightness and outpouring of emotion as we studied the images and discussed what they meant to that person. It can be such a relief to see an outside source confirming what you feel inside, and it felt pretty amazing to be the conduit for this kind of personal connection that rarely happens under normal circumstances. I created the deck with the intention of eventually spending more time to re-illustrate the symbols and work on the design of the cards. I never seemed to find the time until now, but I’m glad that I had a chance to develop my experiences using the cards and giving readings to others before presenting it to the public. After almost 3 years, I am proud to be able to offer this deck to you as a tool to deepen your self-awareness and make connections with others. Thank you so much for your support in bringing this project to life! And Thank You to the band My Bubba & Mi, whose song "Steamengeene" is featured in the video, courtesy of the Free Music Archive. To sign up for my e-mailing list, please subscribe HERE. You can choose to receive e-mails once a month or less frequently. A handwritten Thank You note! ***NOTE: In order to avoid card reading "burn-out," I may stagger the times in which this reward may be redeemed. 1 Golden Moth Illumination Deck set, which comes with guidebook & card spread sheet + 1 small (about 3” x 4”) original artwork - it could be a doodle, a painting, a collage; it’s a surprise and they will all be unique! 2 Golden Moth Illumination Deck sets with guidebook & card spread sheet + 2 small original artworks.